Last day of work for three weeks, time to head off on nb Albion to the Maesbury festival. It has been almost a year since our last update and by special request of my colleague Jason I will endeavor to make daily updates so he will not get bored while I am away. Where did that month go? Apologies to our follower that a month has elapsed since the last post. 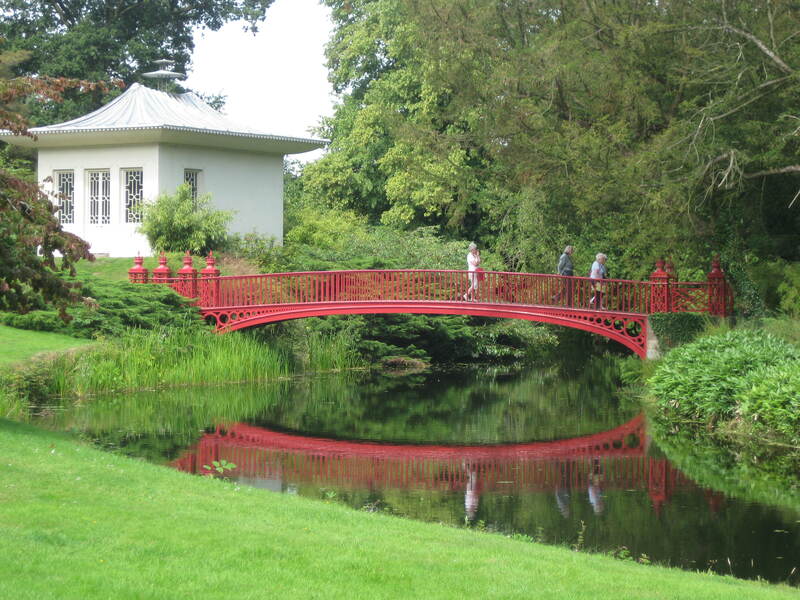 Actually, on this cold wet August bank holiday (fire lit, dog walkers out in hats and gloves) it’s hard to imagine it’s only a month since we were walking around Shugborough in hot sunshine. Brief update – after a great day at Shugborough back at the end of July we decided to head for home fairly speedily. Ira had received a couple of promising calls about contracts and we thought we might need to move quite quickly, and there were jobs we wanted to do on the boat while we had the time. Well, a few days later we got back to a great reception from our friends here, after 513 miles, 296 locks, and 34 moveable bridges (according to CanalPlan). 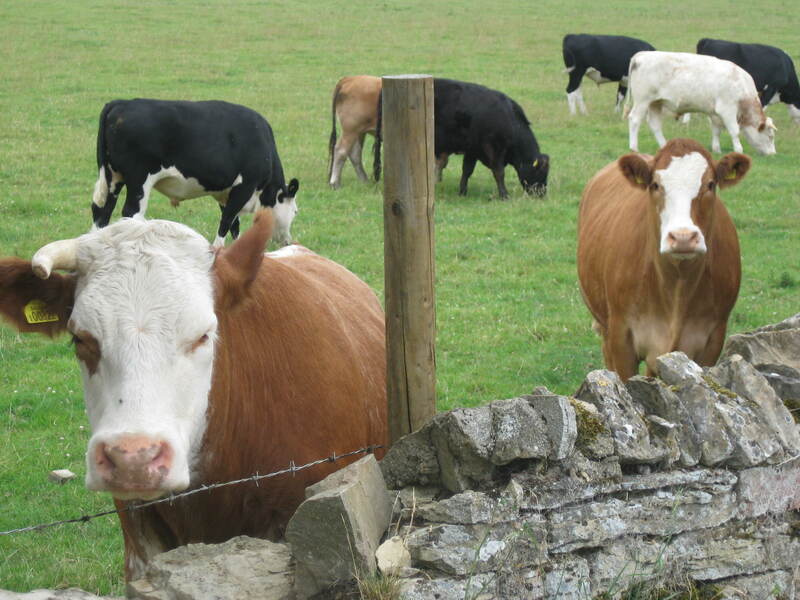 We also got back to the worst broadband signal we’ve had and it’s been dreadful ever since, whatever we’ve tried to improve it – hence no blog. Then absolutely nothing happened on the contracts front. However we had lots to do and and spent a week catching up with things we’re involved in and sorting out the mooring. 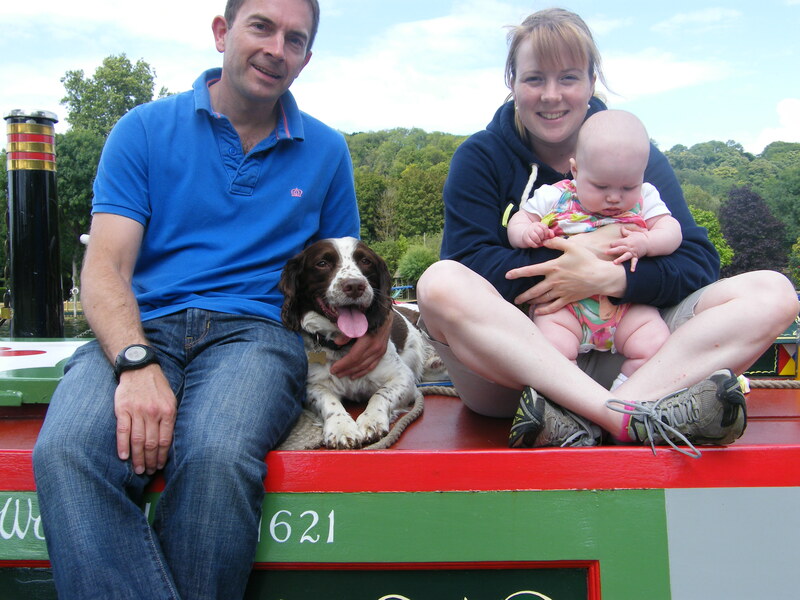 Cal caught up with the Norbury to Newport Canal Restoration CIC, having been elected its Secretary in her absence, while Ira developed their website. On the mooring we cut down three months worth of grass and sorted out the log store, revealed in all its glory (as in “glory hole”) after the felling of a big tree that was blocking the security light – only to have a pile of logs stolen once they were tidy and visible. We immediately made it untidy again. 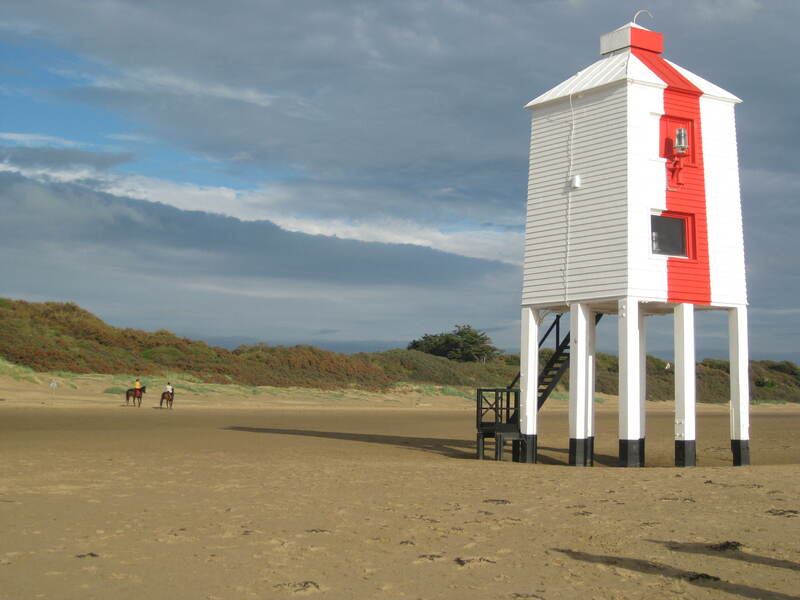 Then, after our journey round England by water, we set off on another one in the by car. First stop was Grantham to see Jenny, Phil and Martha, then on to Middle Wallop to see Hannah and Darcy (John was working away). 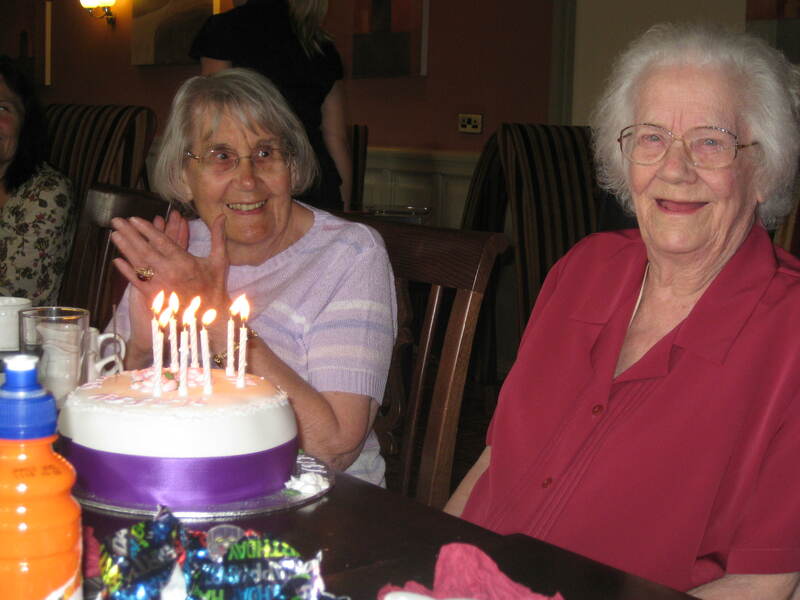 Next was a long-promised week in Highbridge/Burnham on Sea, Somerset for the occasion of Aunt Alma’s 80th birthday. It was great to see everyone and spend some time by the sea. 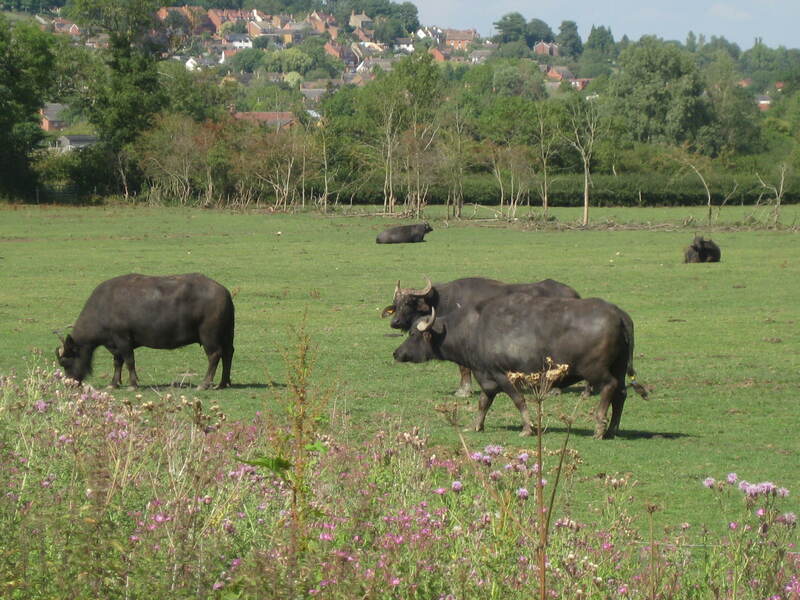 Then it was back to Norbury and normality – well, as near to it as we get! Cal’s been to lots of waterways meetings, Ira is still contract hunting, and we’ve finally begun the DIY. We may even do some more boating …. The last section of the south Oxford Canal proved to be the best. 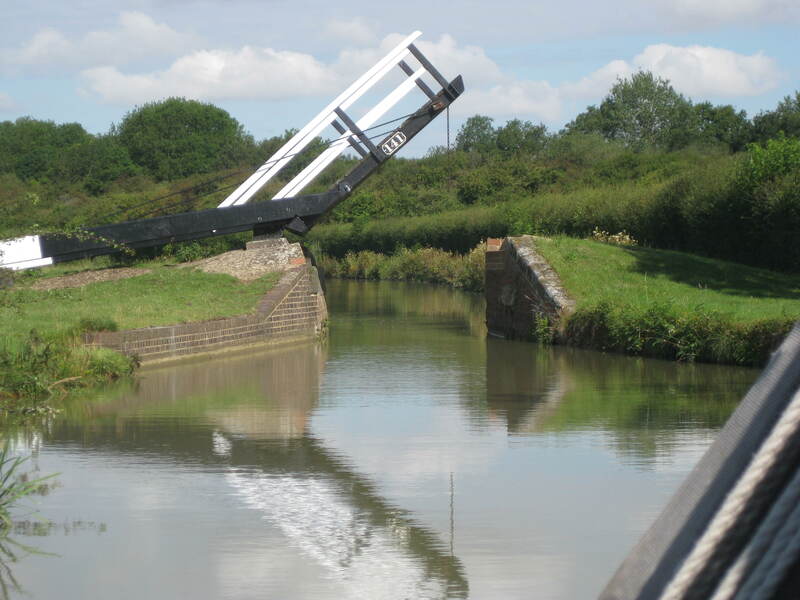 Maybe it was because we had such a glorious day’s weather, but the meandering of the canal through some lovely countryside and the descent down through the locks to Napton on the Hill made for a magical day’s cruising on Friday. We had two lots of visitors in the evening – Jenny and family drove over from Grantham to see us and our friend Lisa called in on her way back from a visit to Oxford, combining us with a visit to her mum who happens to live just up the Hill from the canal. 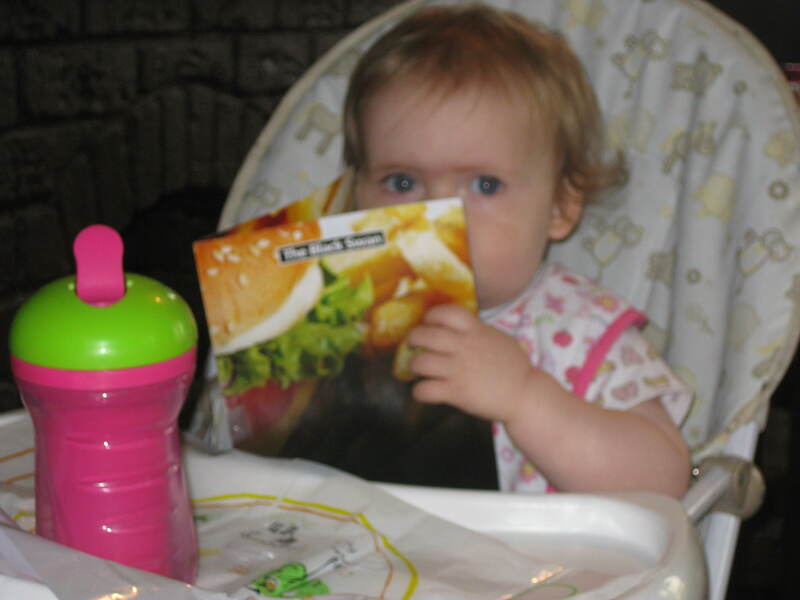 We had expected to see both, but not on which day – and they both chose the same one! Lisa arrived just in time to help with the last lock of the day as the black clouds were gathering, and as Jenny & co arrived the heavens opened. So we squeezed around the last available table in the Folly, gatecrashing a wedding party, and had a lovely evening anyway. 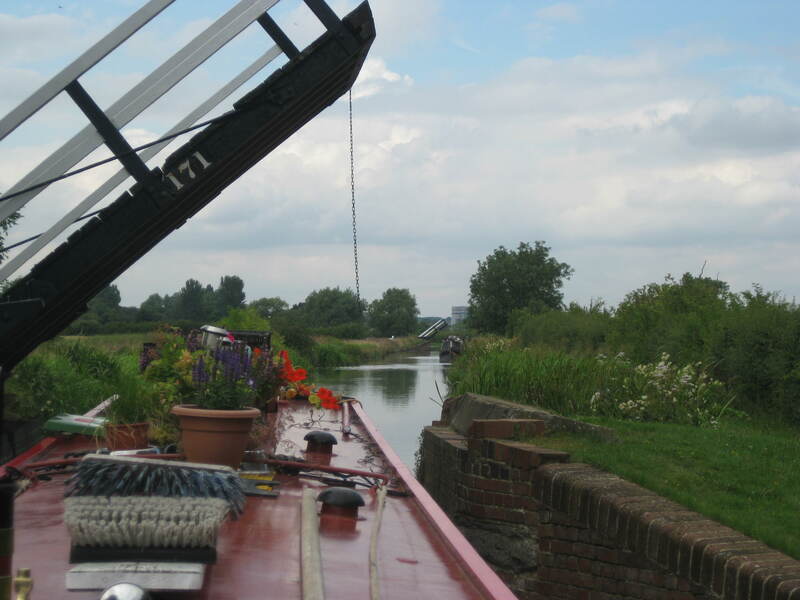 Lisa came down to see us again on Saturday morning and saw us off through the last Napton lock, after which we headed through Braunston and onto the North Oxford – rejecting a final chance to extend our route into Birmingham on the Grand Union in favour of familiar waters and less locks. Passing through Braunston Turn completed the Thames Ring which we had begun at the beginning of May. Up the North Oxford, onto the Coventry at Sutton Stop, catching up with the tail end of the IWA National Festival traffic through Atherstone and Glascote Locks. It was good to see the gathering of working boats at Alvecote loading coal for the Festival but we couldn’t help but be glad they weren’t in front of us at Glascote; even though we were fairly early there were six boats in front of us and it took an hour and a half to get through the two locks. Today we came through Fradley Junction – no delays at all, helped by the presence of lots of IWA and BW volunteers assisting at the locks. I understood from the the BW man who helped us, that while the IWA people could collect donations like any other lockwind, the BW people couldn’t until they became a charity next year! So how about them taking a collection and adding it the IWA coffers? But perhaps I misunderstood over the roar of the water and boat engines. We passed several historic boats on their way to the Festival, including President (in steam) and butty Kildare. 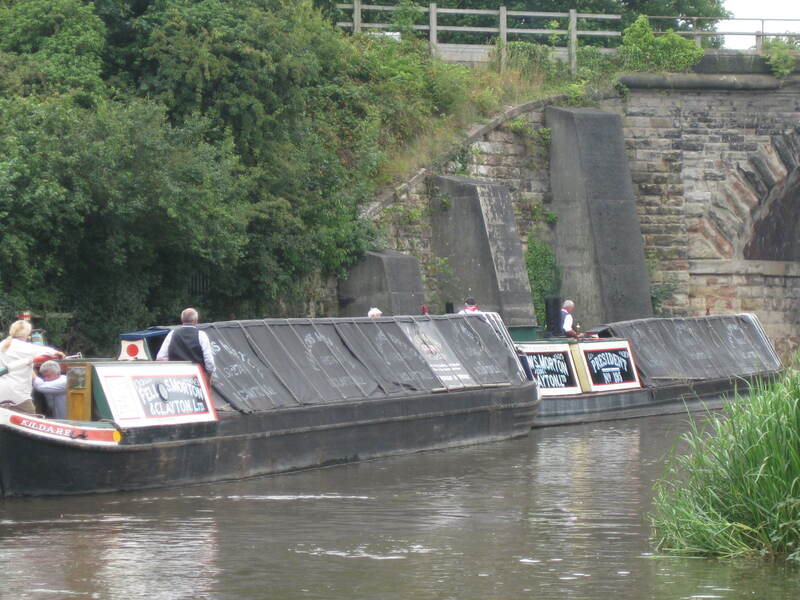 Our pleasure at seeing them was marred by the fact they were moored having a tea break, past the end of the visitor moorings on a blind bend in the bridge hole under the railway at Rugeley, thereby obscuring what limited visibility existed on the turn. We could see the boats from our side so were approaching slowly, though of necessity on the wrong side of the canal, but the narrowboat approaching (too fast) in the opposite direction between the moored boats on one side and overgrown vegetation on the other had no chance of seeing us, or us him. We met in the bridge hole and managed to avoid a collision with either of the historic boats – but it was close. What made it worse was that the crew watched it all happening and no-one said a word to us, in greeting or otherwise, nor did they signal to either of the oncoming boats that another boat was approaching, which they would have seen quite clearly. I’m sure their working forebears would have been more polite. Tonight we are moored in a lovely spot alongside the Shugborough Hall Estate. While we ate dinner, we saw hot air balloons over the parkland, and a deer wading in the canal directly opposite us. Why is the camera always in the wrong place when you need it? 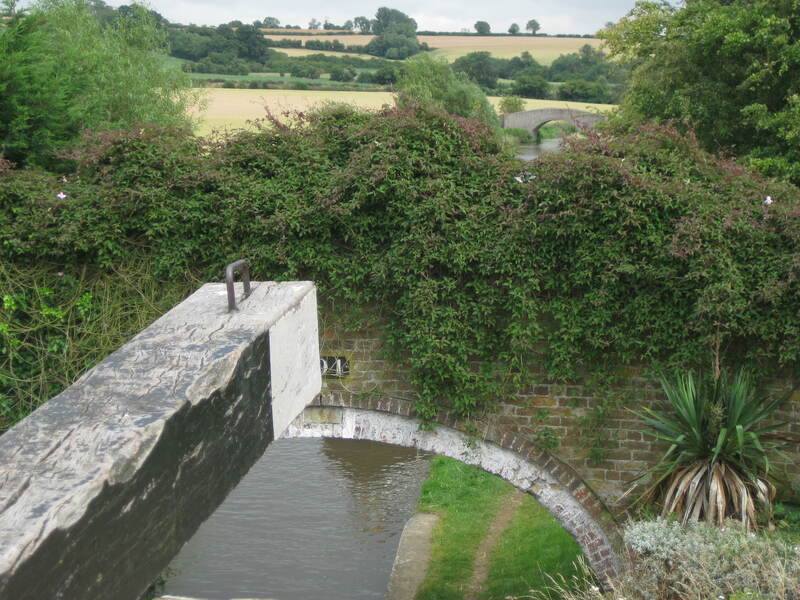 Today we completed our ascent to the summit of the Oxford Canal. Admittedly that’s not very high, but it’s taken us four slow days to get here from Oxford (five if you count Saturday’s effort) to cover 35 miles, 30 locks and 17 lift bridges. 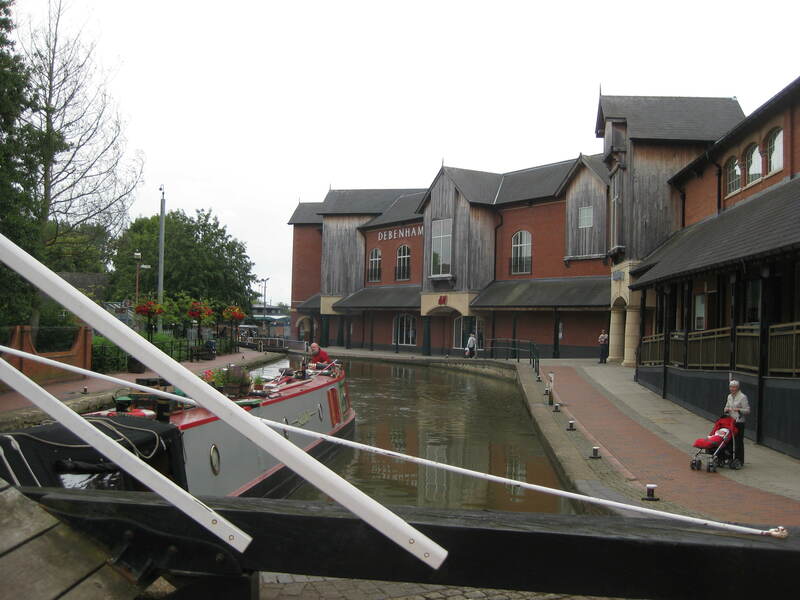 The Coventry and Grand Union Canals earlier in the trip exceeded our expectations, and Cal had fond memories of the South Oxford from a hire boat holiday in the ’80s, but in truth it has been a little disappointing. 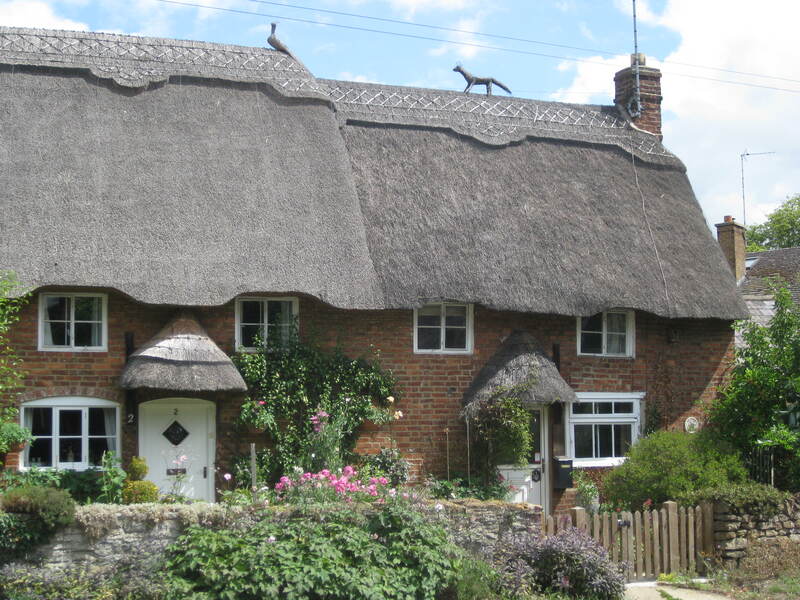 True, there are some very pretty villages and the canal winds it way through some lovely stretches of countryside, there are some unusual shaped locks, lift bridges and sections on the River Cherwell to add interest. 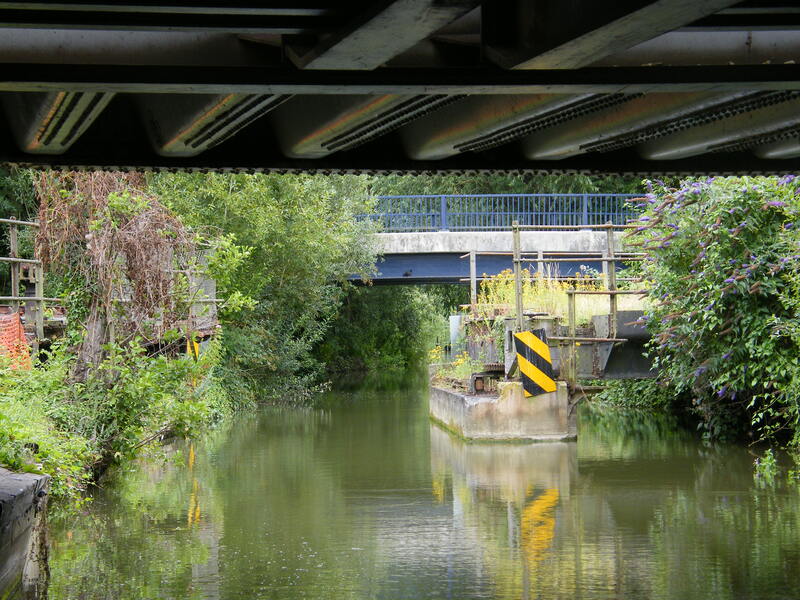 But in its southern stretches it is very shallow (even allowing for water levels being exceptionally low at the moment), banks overgrown with vegetation, long stretches with few possible moorings followed by long stretches with moored boats slowing down passage even more. All of which have made for very slow progress and few really memorable sights. On Sunday night we stopped at Enslow opposite the “Rock of Gibraltar”. 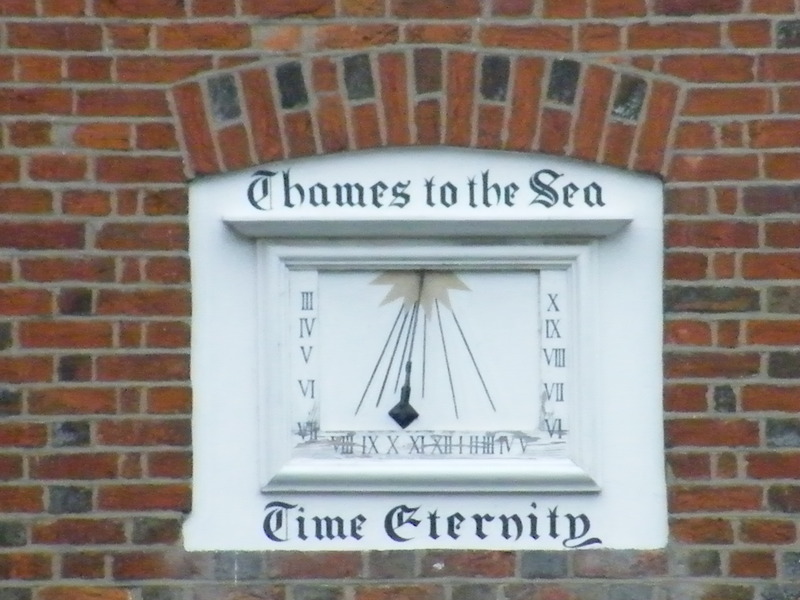 This is a lovely old boatmen’s pub with good real ale – but with very bad 1970’s pop music piped both in the bars and outside! And about 6 customers on a Sunday evening. Monday took us to a lovely rural mooring south of Aynho, before heading for Banbury on Tuesday where we stayed overnight to avail ourselves of a launderette and do a supermarket shop on Wednesday morning. Banbury has undergone a lot of redevelopment since the ’80s. Locking up through the bus station and Castle Quay centre under the curious gaze of shoppers was more like being in Birmingham and a total contrast to the sleepy rural canal before and after it. There aren’t many facilities blocks where the crew can nip into Debenhams while the boat takes on water! Even more surreal is the survival of Tooley’s in the middle of it all. Above Banbury the canal has become more interesting. 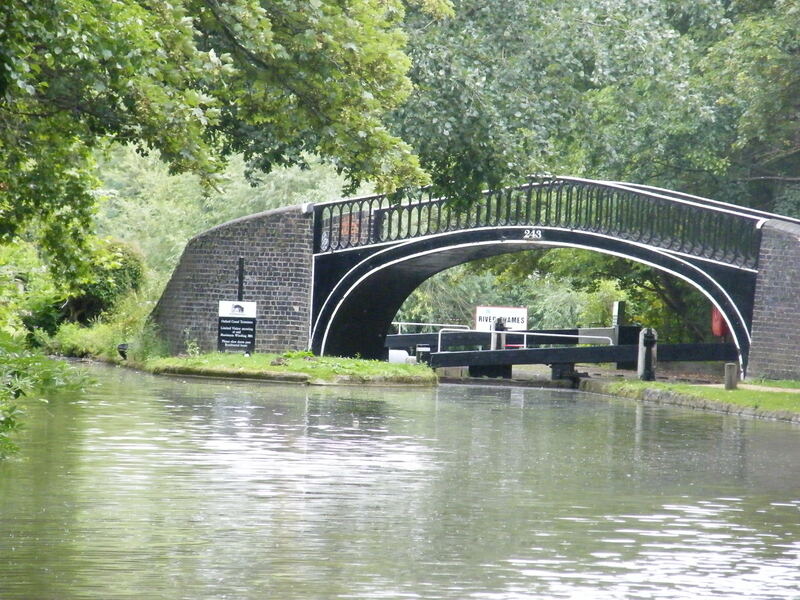 Another remote mooring on Wednesday night, then a stop in the charming village of Cropredy this morning. It won’t be as peaceful when the annual Fairport Convention Music Festival is on in a few weeks time. Two short flights of locks brought us to the summit – and disaster! 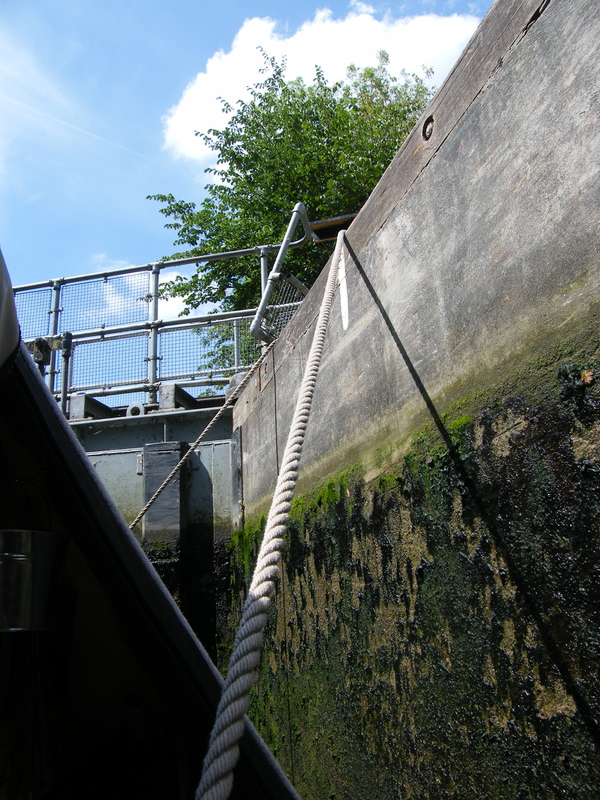 Pulling in above Claydon top lock (ironically onto one of the few planned moorings with rings), with a noise as if we’d run over a pile of bricks, the engine stopped and the swan neck jumped out of its attachment to the rudder. After much consideration over a cup of tea and a certain amount of trial and error trying to get it back from above, the skipper decided there was nothing for it but to enter the water. With judicious use of mooring plank as lever from above and the technical stuff going on under the water, success was achieved. In the end, it turned out that the whole thing had been caused by a length of knotted rope, not a ton of bricks at all. We have the photos but feel they are not suitable for those of a nervous disposition. Well, after two days of blistering heat we started Saturday with torrential rain which didn’t let up till after lunch. We laid low till it stopped, then set off at about 2.00pm. 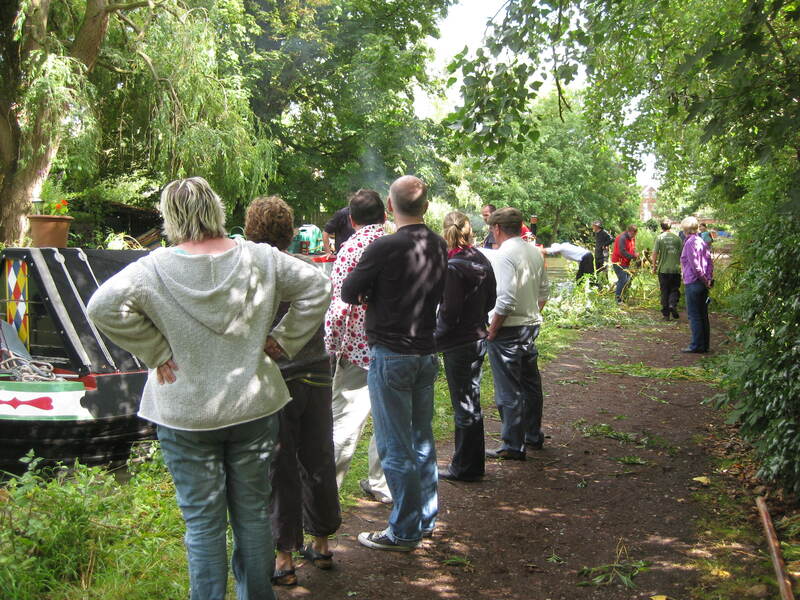 We hadn’t been travelling more than 15 minutes when our way was blocked by the fallen branch of a willow tree – well, more like half a tree, split off from its parent and lying across the canal, luckily in one of the conservation areas where no boats were moored and no one had been passing underneath. A boater first on the scene on the other side said he’d phoned BW an hour and a half before, and was pulling leaves and small branches out of the water. With persistence, he scraped his boat through, but we realised we’d have no chance with Albion, we couldn’t get within a yard of the bank even to moor. We too rang BW’s emergency line and were promised a call back. Luckily, College Cruisers, just back down the canal into Oxford had five hire boats due to set out (they too had phoned BW about the problem) and decided to tackle it themselves. Using Albion to access the tree, with Ira moving the boat forward and backwards as required, they set about with saws and ropes and, with the help of the ever increasing crowd of boaters (stacking up on both sides, mostly hire boats) and gongoozlers, bit by bit the obstruction was cleared out of the canal and onto the towpath. By the time Cal got a call back from the BW engineer(?) 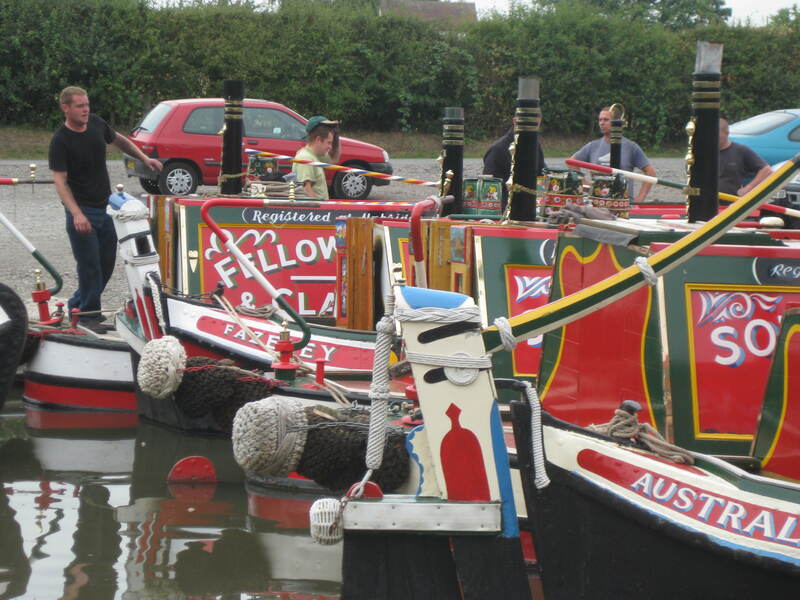 the work had been done and we were able to get boats through – first two hire boats, then Albion, to great cheers. The dogs meanwhile were out on the towpath having a whale of a time and entertaining the onlookers with their antics. 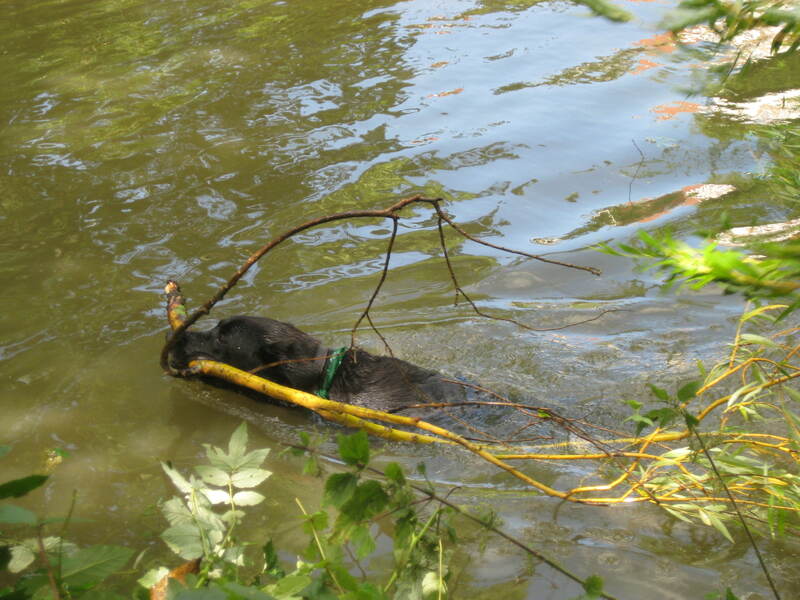 They were entranced by all the messing about with sticks in the water and in the end Zep couldn’t resist, he jumped in and dragged out a huge branch, to cheers of his own. 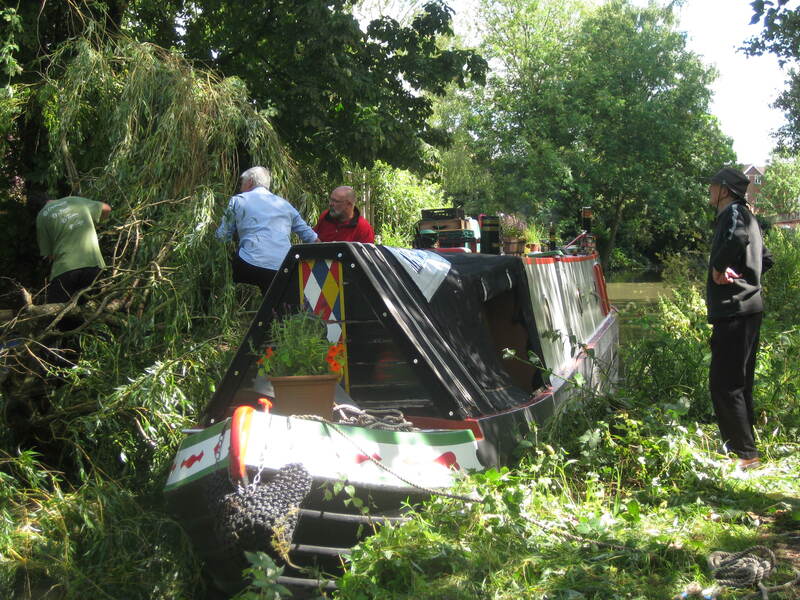 By the time we’d filled up with water after the next bridge and cleared the willow twigs and leaves off the prop, we’d had enough, and moored in the shrubbery that passes for the Wolvercote moorings – having taken over three hours to travel two miles. We don’t know when, or if, the BW man did turn up, but had it not been for the DIY approach there would have been a lot of unhappy hirers today. After 14 days cruising with the big boys on the Thames we are back on the canal system at Oxford. We had a eventful time meeting new people, being laid up waiting for the alternator to be fixed and catching up with the family at Henley and Abingdon. 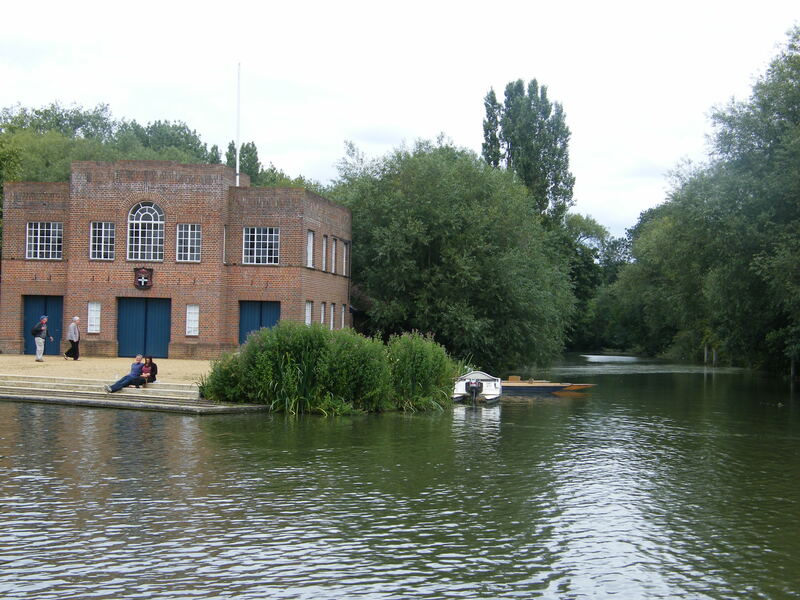 Now back to where we left you at Abingdon, the onward journey took us to Oxford passing the university rowing clubs laid out along the banks, one for each of the different colleges. We had thought of mooring opposite Christchurch Meadows just before Oxford’s Folly Bridge but as we were on the last day of our Thames license we decided, against some advice which had recommended using the Duke’s Cut, to head up onto the Oxford Canal through Isis lock. 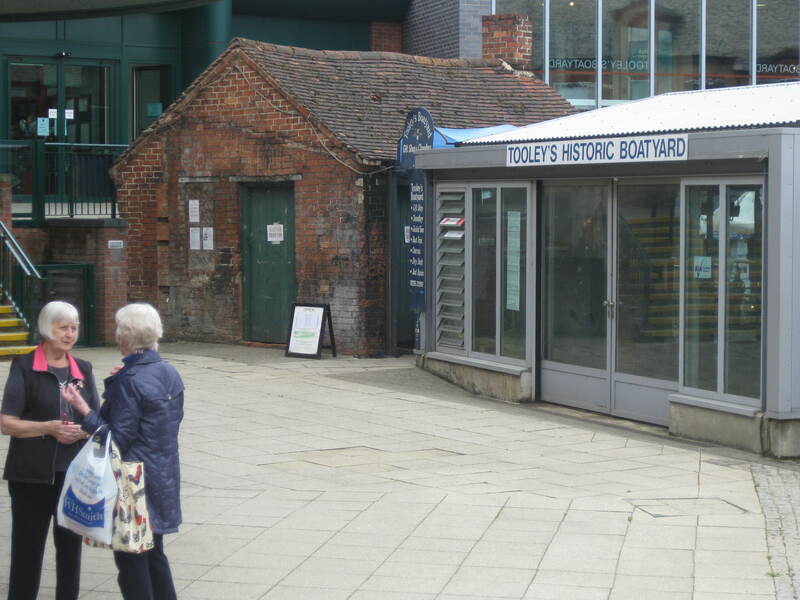 Once through Folly Bridge, we thought we were on a different river – or it might have been a canal. Gone was the broad expanse of water and big cruisers, we were suddenly in a narrow waterway passing unnoticed behind back gardens. The entrance to the Sheepwash Channel which takes you onto the canal wasn’t even marked! After a tricky bit of manoevering underneath the railway and round a right angle bend into the lock, we were rewarded by a fantastic mooring just up from the lock within 10 minutes walking of the city centre, but in another world. We spent two great days exploring Oxford, mainly just walking around in the sunshine admiring the architecture, with visits to the Pitt Rivers and Natural History museums. We discovered a great little pub in Jericho just on the other side of the canal, recently reopened, the Old Bookbinders, and spent our evenings there. On Friday evening we were joined by friends from Mold, Gillian and Glyn, who happened to be in the area for the weekend, saw our location on Facebook and contacted us to meet up. A lovely surprise and a good ending to our time in the city. 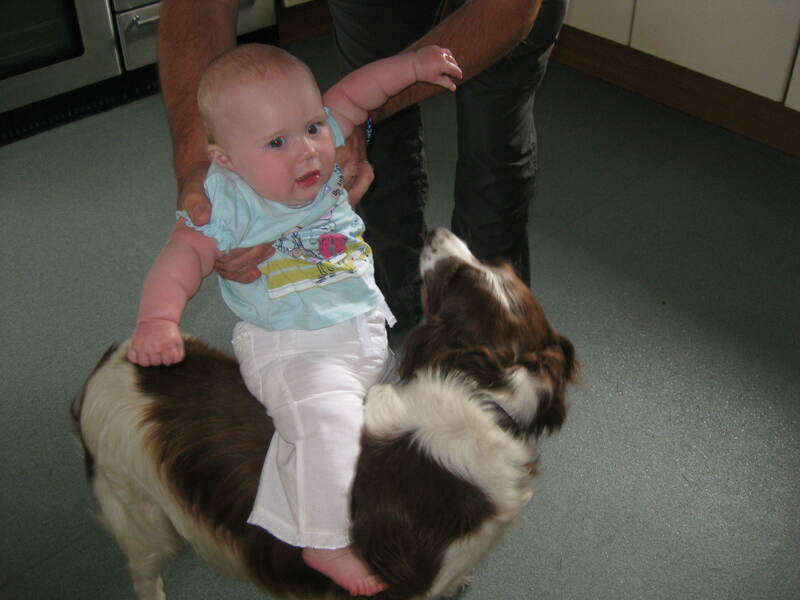 We stayed in Henley in Sunday as it was a convenient place for Jenny, Phil, baby Martha and Toby the spaniel to visit us on their way back to Grantham from holiday in the West Country. It was lovely weather and we had a picnic by the boat in the park and a walk into town for an ice cream. We had intended to move on after they left, but the queue at the lock of boats departing the festival was right back to our mooring for most of the day, by the time it died down it was after four, we decided it was too late to set off and stayed another night. A long and uneventful day’s cruising took us to Wallingford. Having passed lots of nice mooring spots earlier in the day, there were none to be found when we wanted to stop. Town moorings fill up very early so we knew we had little chance once we reached the town itself. We tried one spot on the “official” meadow moorings below the bridge but went fast aground a yard from the bank (and they actually charge for those!) so got ourselves off and upstream, mooring tied to a couple of trees on the towpath further up – a tranquil spot apart from the nearby RAF helicopter base at Benson which seemed to be on exercise till the early hours. Ira has been trying to photograph red kites for the last few weeks; when we went for a walk later a whole flock of them were following the tractor as the farmer was cutting grass in the field and he didn’t have his camera. We remember when kites were almost extinct in the UK and birdwatchers would flock to mid and west Wales to see the last rare survivors; who would have believed they would become so common again in south east England. 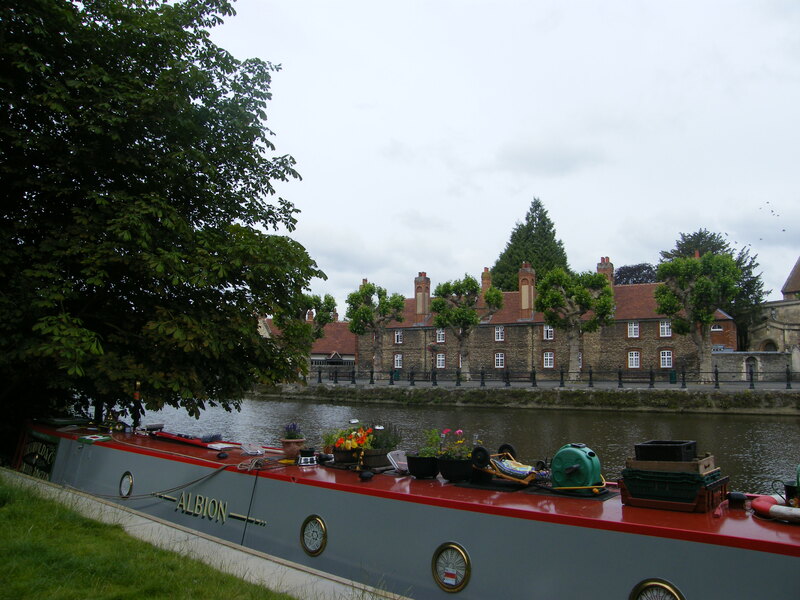 Tuesday’s destination was Abingdon, which we made in much faster time than expected and squeezed on to the end of the moorings near the sports field, deploying the secateurs to aid getting off the back of the boat. Of course, we then found lots of space further up, but we’re quite fond of trees so stayed put. It was time for another family visit, this time Hannah, John and Darcy, this being the nearest point we would reach to their home in Middle Wallop. They arrived at the church directly opposite our mooring and we had to walk right through the town to find them – one of several times a dinghy would have been handy! We enjoyed a pub lunch and walk around the town. Abingdon is a beautiful place and would have repaid further exploration, but our Thames license ran out the next day so it will have to wait till next time.